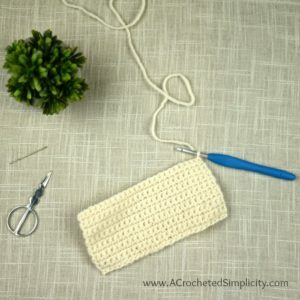 The crochet spike stitch is a super simple stitch that is used to add visual interest to projects. 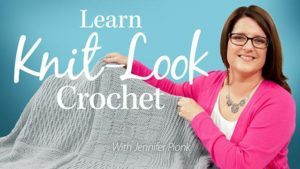 You may have also seen it referred to as a long single crochet or elongated single crochet. It is worked like a regular single crochet with the exception of where you place your hook to begin the stitch. 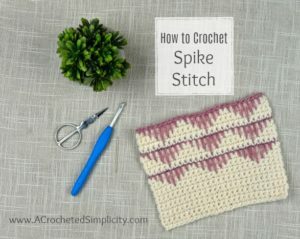 In this tutorial, you’ll learn how to successfully work the crochet spike stitch! Before we begin, let’s go over a few stitch abbreviations and make a small swatch. Yarn: You can use 2 colors of any weight yarn you’d like. I used the worsted weight/4 yarn Lion Brand Yarns Wool Ease in Fisherman and Dark Rose Heather. These items are available through our affiliates below. You can follow the swatch directions written below, or work any multiple of 8 chs + 2 chs for the foundation chain. Fasten off MC. 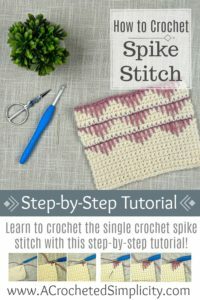 Continue on to Crochet Spike Stitch Tutorial. 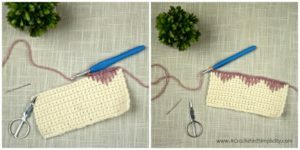 Step 1 (Left): Using a 5mm crochet hook, join CC w/ a sc in the first st (click HERE for join w/ sc tutorial). The tapestry needle in this photo shows where you will insert your hook to begin the spike sc. Step 2 (Middle): Insert your hook into the next st, 1 row below the current row, yo, pull up a loop that is the same height as your current row stitches (do you see why this stitch is sometimes referred to as a long sc? ), yo. Step 3 (Right): Pull through both loops to complete the stitch. You’ve just completed a spike sc 1 row below the current row. Now let’s work even longer spike sc stitches! The further down you insert your hook to begin the spike sc, the longer your spike stitches will be. Step 4 (Left): This photo shows you where to insert your hook to work a spike sc 2 rows below your current row. Step 5 (Middle): Insert your hook into the next st, 2 rows below the current row, yo, pull up a loop that is the same height as your current row stitches, yo. Step 6 (Right): Pull through both loops to complete the stitch. You’ve just completed a spike sc 2 rows below the current row. Let’s work even longer spike stitches! Step 7 (Left): This photo shows you where to insert your hook to work a spike sc 3 rows below your current row. Step 8 (Middle): Insert your hook into the next st, 3 rows below the current row, yo, pull up a loop that is the same height as your current row stitches, yo. Step 9 (Right): Pull through both loops to complete the stitch. You’ve just completed a spike sc 3 rows below the current row. Let’s go just a little longer! Step 10 (Left): This photo shows you where to insert your hook to work a spike sc 4 rows below your current row. Step 11 (Middle): Insert your hook into the next st, 4 rows below the current row, yo, pull up a loop that is the same height as your current row stitches, yo. Step 12 (Right): Pull through both loops to complete the stitch. You’ve just completed a spike sc 4 rows below the current row. Now let’s gradually work shorter spike stitches. Continuing on from Step 12, work a spike sc 3 rows below the current row, then work a spike sc 2 rows below the current row, then work a spike sc 1 row below the current row. This sequence completes one repeat of the stitch pattern shown in the photos above. You can fasten off, or continue practicing to complete a swatch like the one shown in the photo below. Work the following to complete your swatch like the one shown in the photo above. Fasten off MC. Continue to Spike Stitch Row. Fasten off CC. Repeat one more section of Main Color Rows followed by one more Spike Stitch Row. Weave in ends. 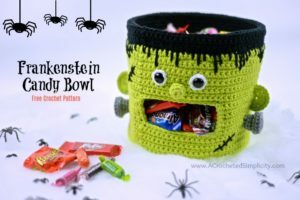 I recently used the crochet spike stitch on my Frankenstein Candy Bowl. To find this Free Crochet Pattern, click the photo below.